Multifunction (MFP) printers have become an increasingly popular business fixture. The rise of digital communication has put the printer in the center of nearly every workflow in the modern office, with new print equipment and features taking center stage in a variety of processes. It might sound unusual that the printer would be such an important tool in an age guided by increasingly digital infrastructure and mobile-oriented workflows. But today’s offices still rely on paper – although in different ways compared to the pre-Internet era. The fact is that paper isn’t going anywhere anytime soon. The paperless office is a myth that substantially oversimplifies the real impact paper-based processes have on the office environment. However, digital transformation is real, and offices throughout New Mexico need to implement technology for capturing paper documents and converting them into digital formats. This is what the MFP printer excels at – and why increasing numbers of small businesses and enterprise are investing in them. The main characteristic that separates a regular printer from a multifunction device is scanning, copying, and faxing capability. The most advanced MFP printers on the market combine these capabilities with optical character recognition that automatically transforms paper documents into editable digital files. This feature is of primary importance to businesses looking for opportunities to automate processes and reduce manual data entry workloads. Combined with the ability to scan cloud-based document management platforms, optical character recognition provides an easy, accurate way to convert paper documents into digital files available to the entire workforce. 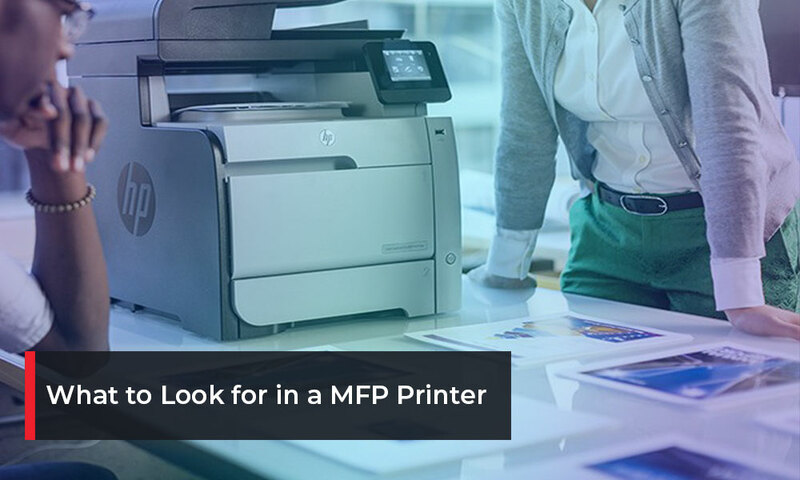 This is the most important capability that executives and office managers looking at MFP printer options should be aware of. Without digital conversion and document management integration capability, your multifunction device cannot offer truly valuable long-term performance. • Mobile Compatibility. HP’s LaserJet series supports printing directly from mobile devices. This allows users to print documents directly from their mobile phones and tablets without having to access the company network. • Enhanced Workflow Capabilities. HP enterprise MFP printers can scan to SharePoint or any other cloud-based document management solution. This turns a complex, multi-step task into one that any employee can complete with the touch of a single button. • More Efficient Performance. HP’s JetIntelligence cartridge technology offers high print yields with reduced consumable usage and intervention times. This prevents downtime and decreases the total cost of ownership of the print asset. • Benchmark Security. HP printers feature built-in security features capable of protecting themselves from cyberattacks in real-time, such as automated firmware verification and print queue encryption. Being able to quickly and accurately convert documents from paper to digital formats is a clear advantage when choosing between MFP printer options. However, there are other features that could influence the overall value of certain models for your business, depending on what an average workday looks like for you. Fast, high-volume automatic duplexing might be a deal breaker for your organization if you regularly tie up print resources making large finished documents for clients. This is often the case in the legal, financial, and educational sectors, where a combination of regulation and convenience makes paper the media of choice for a large number of documents. Duplex capability can be an important cost-saving feature for high-volume workflows. Double-sided printing and scanning allow you to cut the amount of paper you use in half. Manual duplexing can create double-sided prints, but it is time-consuming and error-prone. Those errors add up, leading to additional costs through unused and wasted documents. Similarly, automatic document feeders are important for high-volume workflows of any kind. If employees need to manually feed pages into a printer one-by-one, scanning or converting even a modestly sized document will take a great deal of time that the employee in question could spend doing more valuable work. In order to find out what print hardware is best-suited to your office’s current and future needs, you will need to solicit an expert’s opinion. DSI can audit your print network, collect data on your current print usage, and analyze that data to glean important insights into overall print efficiency at your workplace. With this data, our team can create a customized hardware acquisition plan for your business. We can deploy print hardware designed to fit your needs specifically, while giving you enough headroom to deal with peak business periods and put your business on the road towards sustainable growth. Are you ready to deploy sophisticated print assets at your workplace? Boost productivity today with our help – Contact DSI and talk to an expert.